1 Begin by grabbing a pan and getting it nice and hot over medium high heat. Pour some oil and throw in the onion and garlic and sauté them until the onion is translucent and the garlic is golden in color. Now, add the chicken and sauté this until the chicken is cooked through. 2 For the next step, place the squash in the pan with water, Knorr Complete Recipe Mix Ginataang Gulay, curry powder, Knorr Chicken Cube, and siling haba. Give these at least 5 minutes and then you are done! 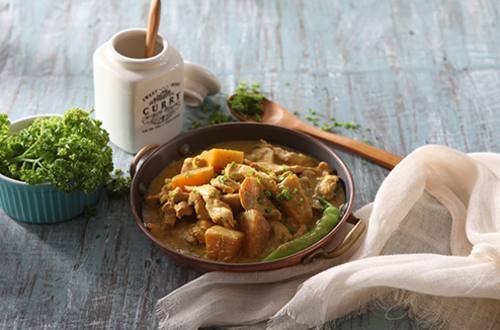 3 Chicken Curry is one of those comfort dishes that you look forward to when coming home because it’s simply addicting. With the added sweetness of kalabasa, you’ll surely end up eating more.